It's the sign of a strong point-and-click adventure puzzle when you know what you have to do, have a basic idea as to how to do it, but don’t know how you’re actually going to. Essentially, you see the door, know it’s locked, and need find a way to open it. 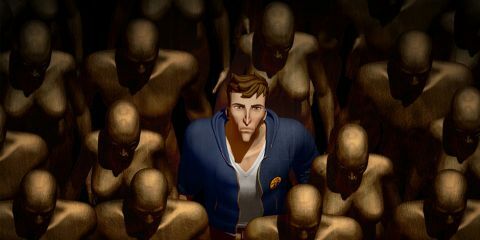 In Yesterday, a new point-and-click adventure from Pendulo Studios, the team behind Runaway and The Next Big Thing, too often we had no idea what to do or how to do it, meaning we were usually left clicking things on other things over and over again, hoping to trip over a nonsensical solution. That's a shame, because Yesterday starts off extremely well, with one of the strongest openings in the genre we’ve ever seen. Within minutes we were sucked into the world, shocked at how quickly things went from light-hearted, Hardy Boys-inspired fun to startlingly dark, X-Files drama. We quickly realized that everything was on the table and that we couldn’t take anything for granted, which isn’t a feeling we typically get in a point-and-click adventure. We were put in the shoes of a man named Yesterday who, after a failed suicide attempt, is left with amnesia. His friends and family have tried to bring him up to speed on his life, rebuilding his final few months, but his memories come back in flashes, and often don't really illuminate that much. All he knows is that the “Y” carved into his hand is, in some way, related a cult he was researching in hopes of solving a series of brutal murders. Following a memory-impaired protagonist isn't all that original, but Pendulo uses this trope well, making some of the memory flashes playable, and teaching Yesterday new skills in the process. It's a unique way to take advantage of amnesia, and one we haven't seen attempted in many other games. Other interesting mechanics are added later in the game, functioning to move the story forward while folding in new gameplay caveats. It's during these segments, when the game takes risks and implements new ideas, that it shines. This potential is squandered at the hands of the mangled puzzles. They're often completely impractical, even by genre standards, breaking away from logic in such ways that it makes it difficult to understand what the game expects us to do. At one point we needed to cut a sliver of aluminum off of a soda can, which we used to break open a padlock, which... doesn't make any sense. We're not able to actually mentally solve puzzles if the solutions are completely arbitrary, and this problem hamstrings every other element of the game. There are a few elements in place to make the puzzles more manageable, including a hint system and the ability to see all intractable objects in the area. While they help, they end up feeling like more of a crutch, and one that Pendulo leaned on too heavily. Puzzle solutions are barely ever intuitive, and we found that we needed to constantly click to see what we could interact with, as there seemed to be little rhyme or reason as to what we could and couldn't pick up. At least it did its job, though - the hint system is insufficient at best, and oftentimes flat-out condescending. Being completely lost is frustrating enough as is, and clicking on the hint button only to be spoken down to is just plain insulting. Seeing “Look for wheels. Come on, they’re in plain sight,” is just annoying, especially when we didn’t know why we were looking for wheels in the first place. We'd be able to forgive some of these issues if the story held together, but while investigating satanic cults and unraveling our character's mysterious past sounds like fun, it's potential was cut short by the game's unimpressive run-time. At under five hours, Yesterday's conclusion shows up right as it feels as though the narrative should be gaining speed, and we were confused to see the credits rolling right as things began to become interesting. The inclusion of three different endings, activated by just clicking on the ending we wanted, feels forced, as if there was no real internal consensus on how to end the game. It's still satisfying, in a way, it just feels as though it could have been so much more. There were also technical hiccups, including issues with getting the game running at all, but in the end those problems were overshadowed by design issues. At first, Yesterday looked as though it was going to be a sound adventure title thanks to a strong premise, fine voice acting, and bold storytelling that paved the way for success. Eventually it lost focus, however, and Pendulo’s interesting story was too bogged down by asinine puzzles that weren’t witty, intuitive, or interesting, leaving us wanting in just about every area. There's some life in it, and a few folks might be able to put up with the issues, but for the most part, it's not really worth the time spent clicking random objects on other random objects.